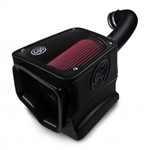 S&B Cold Air Intake Kits are engineered to maximize the amount of airflow to your vehicle's engine. Tested to the ISO 15011 standard, the same tests used by Chrysler to design the original induction system in your vehicle S&B Cold Air Intake Kits are engineered to maximize the amount of airflow to your vehicle's engine. Tested to the ISO 15011 standard, the same tests used by Chrysler to design the original induction system in your vehicle S&B intake for the 17 Ford Powerstroke has two airflow configurations depending on your needs. Using the included silicone box plug will seal the airbox making the front facing primary inlet scoop the main source of airflow.